Able Surveyors works across London, Essex and the Home Counties, providing expert property services to private and commercial clients in Tower Hamlets. We have experience with a wide variety of property from period cottages and contemporary, new-build apartments to commercial units and industrial warehouses. Whether you want a stock condition survey for an entire portfolio or simply a RICS property survey for a single home, Able Surveyors can help. For assistance with buildings in and around Tower Hamlets, please get in contact with us today. You can speak to one of our friendly team by calling 01277 651605 or emailing info@ablesurveyors.co.uk. We look forward to hearing from you. Able Surveyors offers a complete range of surveys and management services to help clients make informed decisions about property purchases and maintenance plans. Buyers should consider one of the RICS property surveys to establish the condition of the building they are about to buy. Any of our team will be happy explain the differences between Condition Reports, HomeBuyer Reports, and Building Surveys. Landlords that are looking to develop their portfolio and maximise profits can benefit from our professional contract administration and cost management services, as well as stock condition surveys to manage ongoing maintenance schedules. In the UK, sellers are not necessarily obliged to provide buyers with information about the property’s condition – it’s up to the buyer to determine whether they think the property is a sound investment. Property surveys provide buyers with a professional insight into a structure’s condition, from a completely impartial perspective. Understanding potential risks or defects within the building can give you a stronger negotiating position if you still wish to buy the property, or even provide the information you need to walk away and find a more suitable home. Without a survey, buyers are effectively going in blind. It’s not uncommon for new owners to suddenly discover their home requires serious renovation and restorative work that can end up costing thousands of pounds. At Able Surveyors, we offer all three RICS surveys in order to cater for all property types. Condition Reports provide a brief overview of a property, while HomeBuyer Reports and Building Surveys are increasingly in-depth. For more information, take a look at our survey comparison table or give our team a call. We recently carried out a HomeBuyer Report for a client in Tower Hamlets, providing a valuable insight into the property they were intending to buy. Although the building was in reasonable condition, some repairs were required and our surveyor provided recommendations about the next steps the owner or buyer should take. 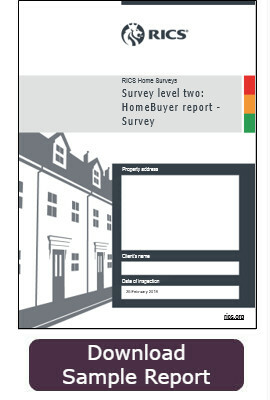 To read the example of a Homebuyers report, please download the PDF below.